Many farms in drought-prone regions of the U.S. rely on drip irrigation as a water-saving method to grow crops. These systems pump water through long thin tubes that stretch across farm fields. Hundreds of dime-sized drippers along the length of each tube trickle water directly onto a plant's base. A farmer can control the timing and amount of watering, delivering only as much water as a crop requires. 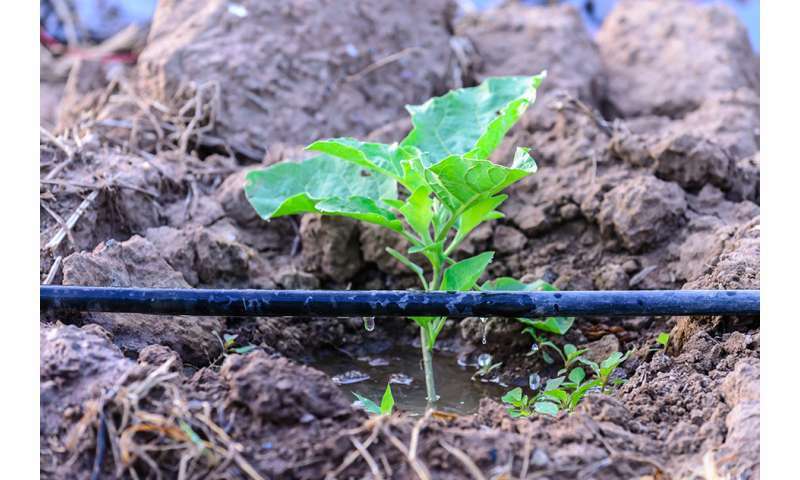 Drip irrigation can reduce a farm's water consumption by as much as 60 percent and increase crop yield by 90 percent, compared with conventional irrigation methods. But these systems are expensive, particularly in off-grid environments where they cost farmers more than $3,000 per acre to install. Now engineers at MIT have found a way to cut the cost of solar-powered drip systems by half, by optimizing the drippers. Furthermore, these new drippers can halve the pumping power required to irrigate, lowering energy bills for farmers. The team modified the drippers' dimensions in a way that significantly reduces the pressure required to pump water through the entire system, while still delivering the same amount of water. "Many small farmers in India make only a few hundred dollars a year, so a drip irrigation system is way outside their price point," Amos says. "Low-cost drip systems could help them increase their yield and income, so they can get out of the cycle of poverty." The team has published its engineering theory on dripper design in PLOS One. The paper's co-authors are lead author and graduate student Pulkit Shamshery, former MIT postdoc Ruo-Qian Wang, and undergraduate Davis Tran. "The silver bullet here is drip irrigation … but it's exorbitantly expensive," Winter says. "The main cost driver is the pump and power system. That laid the foundation for our research project: Could we make drippers that operate on much lower pressures, and thus cut the pumping power and the capital costs?" To do this, the researchers set out to characterize the behavior of existing "pressure compensating" drippers—drippers designed to maintain a constant flow rate, regardless of the initial water pressure that is applied. Such a feature enables every dripper along a tube to deliver the same water flow throughout a farm field, regardless of how far away an individual dripper is from the central pump. Most conventional drip irrigation systems are designed to operate the drippers at a pressure of at least 1 bar. To maintain this pressure requires energy, which constitutes the main capital expense in off-grid drip irrigation systems, and the primary recurring cost in on-grid systems. Winter and Shamshery aimed to design pressure-compensating drippers to operate at 0.1 bar—one-tenth of the pressure of commercial systems. This reduction can halve both the power required to pump water through the drippers and the capital cost of an off-grid drip system. The team set out to characterize the features in drippers that produce a pressure-compensating effect. To do this, they first generated a model of a conventional pressure-compensating dripper in MatLab, a numerical computing program that enables researchers to change the dimensions of a model to produce a change in behavior. In this case, Shamshery studied the dynamics of water flowing through the modeled dripper, and then came up with a mathematical description to explain how a dripper's internal features affect fluid flow and water pressure. Shamshery then coupled the mathematical model with a genetic algorithm—a computer program that simulates evolution of, in this case, various parameters in a dripper. For instance, the team selected a range of dimensions for certain features and tested their flow behavior in simulation. They discarded those dimensions that produced undesirable water pressure, and kept the better performers, which they fed back into the algorithm with a new set of dimensions. "We let this evolve through multiple generations," Shamshery explains. "You end up expressing the features and geometries that give you good performance, and you kill off the features that give you bad performance." They evolved the dripper's dimensions to a geometry that produced an optimal flow rate with an initial pressure as low as 0.15 bar. Using these optimal dimensions, the team fabricated a few dripper prototypes and tested them in the lab, with results that matched their simulations. "With these drippers, poor farmers can now grow higher-value crops, like off-season crops that they couldn't grow unless they had rain, and make more money to try and get out of poverty," Winter says. "In places like California, with a history of blackouts, this means not only less water consumption, but less energy [used] for agriculture." Next, the team plans to optimize the rest of the drip irrigation system, which will further reduce the system's cost. The researchers will pilot solar-powered drip irrigation systems in Jordan and Morocco with USAID in the coming two years. "It turns out there is a massive untapped market in off-grid situations," Winter says. "If you look at the developing world, there are about half a billion small farms with 2.5 billion people. For them, this technology could be a game-changer."